"Twenty Miniature Photos - San Francisco - Circa 1938. " (1930) Twenty Miniature Photos - San Francisco - Circa 1938. -Condition: Excellant A wonderful collection of miniature photos with information written on the backs about famous locations in San Francisco. 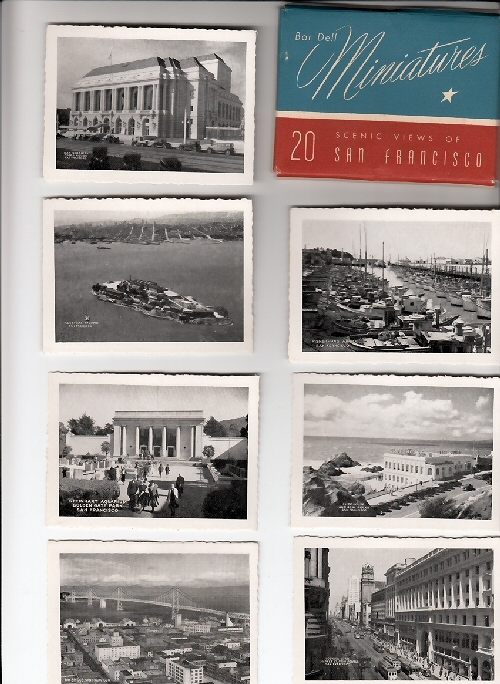 The photos include Golden Gate Bridge, US Mint, Mission Dolores, Union Square, China Town and many more. These are all inside a small envelope that was possible to mail. The Cards were produced by Bar Dell. Prints are done in High Gloss. Photos measure 3 1/2" by 2 1/2". Price: $12.00 + shipping.